With this Giant Inflatable Beach Ball summer time fun will be bigger and better than ever! 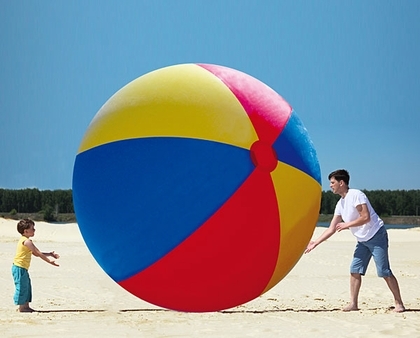 Go big or go home on the beach this year with our Giant Beach Ball. With 10 feet of fun, this supersized beach toy is sure to be the hit of the summer. Made of extra thick vinyl material for durability. Includes a repair kit just in case of emergency. Simply inflate this huge beach ball and let the games begin! This Extra Large Beach Ball usually ships in approximately 1 business day. This item does not ship express or to Alaska, Hawaii, or apo addresses.